He's the man that makes Borussia Dortmund tick, the midfielder who keeps the heart of Die Schwarzgelben beating rhythmically, and the good news for BVB fans is that Julian Weigl is only going to get better. Real Madrid superstar Toni Kroos has tipped Weigl to become "a world-class player", and given the way the mature-beyond-his-years midfielder has progressed with giant forward strides so far, there is little to suggest the former Bayern Munich man will not be proven right. There was more than a hint of Weigl's skyscraping potential when he emerged at 1860 Munich, earning favourable comparisons to the Bender twins, Sven and Lars, who had also risen to prominence at the Bavarian city's second club. Named 1860's youngest-ever captain at 18 ahead of the 2014/15 season, the angelic-faced Weigl displayed a devillish side as an ill-advised night out with three team-mates earned him the ire of coach Ricardo Moniz and cost him the armband. It still did not put Dortmund off, though, as they swept in to pick up a player that — though highly rated — was only "one of the future for central midfield, and in whose enormous potential for development we believe," as BVB sporting director Michael Zorc described the club's promising new acquisition when Weigl signed in 2015. With Nuri Sahin, Sven Bender, Gonzalo Castro, Ilkay Gündogan and Kevin Kampl in the Dortmund squad at the time, Weigl appeared to be barely in coach Thomas Tuchel's top-five for a midfield berth. Kampl's departure for Bayer Leverkusen smoothed his passage to the first team, and with Gündogan and — in particular — Sahin dogged by injury, the youngster found himself thrust into the thick of the action. It was sink or swim time, and Weigl quickly showed he would not drown under the weight of responsibility. Twenty-five starts in 30 league appearances in his maiden season was a stat worthy of a superhero-in-the-making in itself, but with just eight per cent of his passes going astray, he not only had the best pass completion rate of the BVB squad, but one of the top totals in the entire Bundesliga. Senior caps for Germany followed and — along with the other 2015/16 revelation, Bayern's Joshua Kimmich — a surprise place in the UEFA EURO 2016 squad. 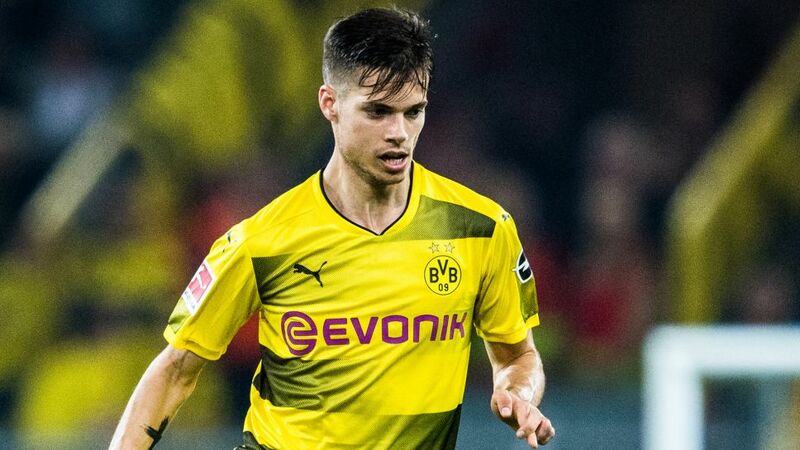 "It was a logical decision for me to extend my contract, one that required little reflection," said Weigl when he put pen to paper in December 2016 on a two-year extension that ties him to the Signal Iduna Park until 2021. It was an even more logical decision for BVB with Weigl — as a delighted Zorc pointed out — "still at the beginning of his sporting development." Watch: Was Weigl as cool when faced with our quickfire questions? Only Pierre-Emerick Aubameyang and Ousmane Dembele played more Bundesliga games for Dortmund in 2016/17 than Weigl, who again featured in 30. That momentum was rudely halted by a broken ankle sustained late last season and meant the now 22-year-old's 2017/18 Hinrunde appearances were — like his team's form — sporadic. The arrival of Peter Stöger as Dortmund coach in mid-December has rejuvenated Weigl. Handed the pivotal role between defence and attack as the metronomic meat in the 4-1-4-1 sandwich his new boss has used to serve up an impressive start to life, Weigl's much-improved form has helped fill the insatiable appetite for success of BVB's passionate fans. If Dortmund are to again eat at the top table of European club football in the UEFA Champions League next season, those supporters will be hoping Weigl can tap into his uncanny ability to tie the team's talents together to help earn BVB an invite to the party.